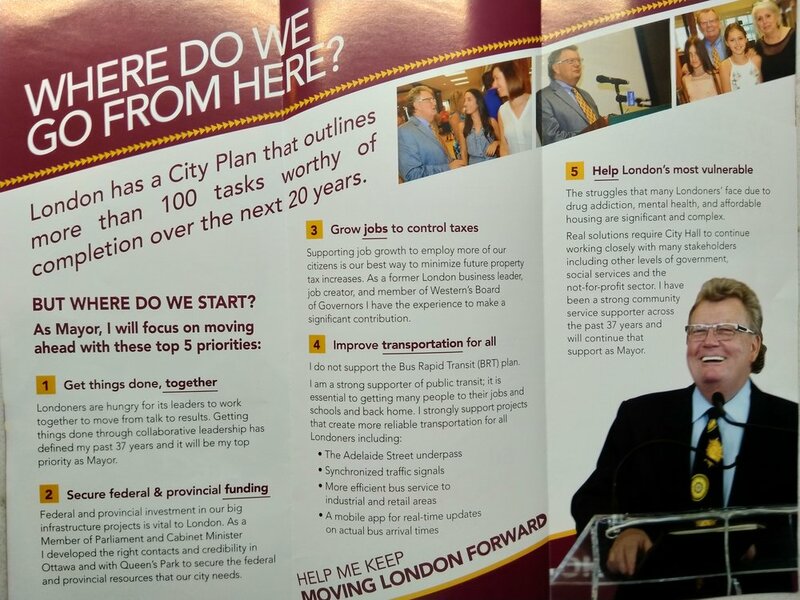 Here’s a news flash: Ed Holder, one of the leading contenders in London’s four-way mayoral race, is in favour of job growth. Holy cow, that’s a stunner. Have I got your attention because here’s another bombshell: He’s in favour of synchronized traffic signals. Has any politician anywhere ever argued against synchronized traffic signals? They’re to the transportation system what waste and inefficiencies are to budget deficits. Oh, and London council approved a synchronization project last year. Council also approved the Adelaide Street underpass recently to keep trains and cars apart at that busy intersection. Holder has boldly thrown his support behind that project too. Look, I don’t know if Ed Holder would be a good mayor or not. I do know he’d be a lot better than Paul Cheng whose next specific policy proposal will be his first. I don’t know whom to support for mayor, so when Ed Holder’s brochure arrived in my mailbox today, I read it. Twice. And I’m still looking for anything resembling a specific idea. Holder has five top priorities, each one a collection of empty words or no-duh pronouncements. The only specific item is his opposition to the Bus Rapid Transit plan. Fair enough. I can’t decide if that’s a good idea or not. But having said he’s opposed, his ideas to move people around the city more efficiently boil down to the Adelaide underpass, already approved, more efficient bus service to retail centres and a better mobile app for London Transit users. And, of course, synchronized stop lights. Beyond that short list of easy-to-endorse ideas, he offers nothing specific among his five priorities. If you think I’m exaggerating, I’m sorry to say I’m not. There is nothing specific anywhere else in his five-priority action plan. He boldly supports job growth but says nothing about how he might help create jobs. He’s in favour of collaborative leadership. Awesome. He reminds us he was a federal cabinet minister and claims that experience will help secure provincial and federal funding for infrastructure projects in London. Which projects? How much money? Don’t sweat it; he knows a guy. That’s it. That’s his platform as described in his brochure. The rest of the brochure lays out his resume, which I acknowledge is impressive. But come on Ed, give us some specific ideas, not just the highlights from your LinkedIn account.